We got up early to ride to Split in an effort to beat traffic, but we needn’t have worried as it was Sunday and even the multilane highway we entered Split on was pretty empty. It was an OK ride and our fastest average speed for any section of the trip. In Split we ran into a Dutch guy who was planning to reach Indonesia sometime before December, and had cycled 4400km in 6 weeks. He was wondering what the roads were like for cycling between Darwin and Sydney, so I told him a little about the difficulties with distances and water. We met an English couple, Pat and Ron, on the ferry. They were a bit older and doing a similar thing to us. 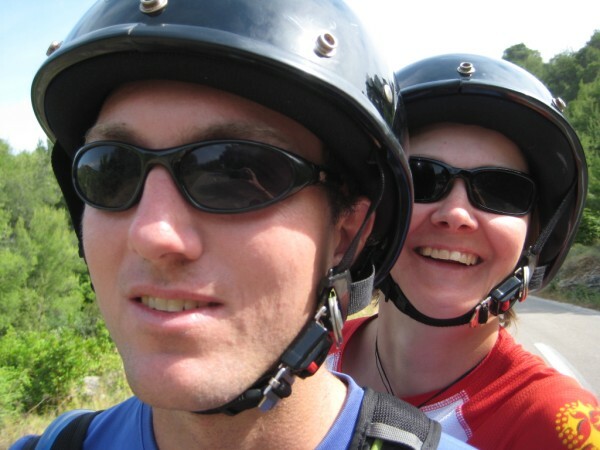 We went together for the ride to Milna where we camped, and they were much more our pace than Matt and Vanessa had been. Hvar is a long thin island with a 77km road from Hvar at one end to Sucaraj at the other. Stari Grad is less than 20km from Hvar, on the other side of the island. The road to Hvar is good for cycling. You have to ride over a big hill (as with all Croatian islands), but there isn’t much traffic. There is a kilometre or so long tunnel at the top which is well lit and worth it for skipping the worst of the hill. It’s very steep getting out of Hvar, but only for a short distance. The town of Hvar itself is very cool. It’s very touristy but nice and lively. 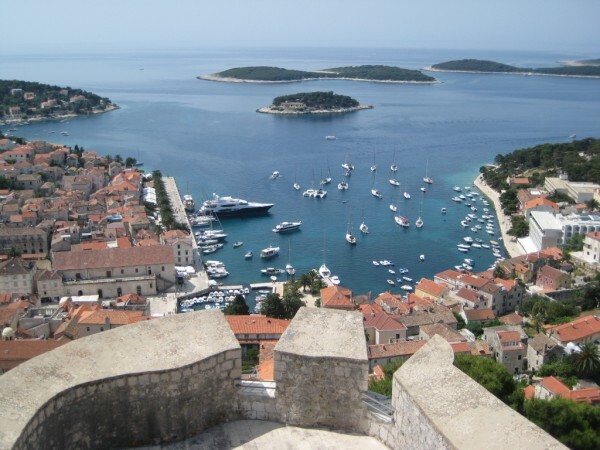 There’s also an awesome castle with fantastic views of the surrounding islands and of Hvar. The Milna campground was about 5km from Hvar and wasn’t great quality, but was cheap at 100 kune/night. It was in a nice place next to the sea, but the ground was rock hard, resulting in lots of bent pegs and a partially erected tent. There was a very good campground nearer Hvar, but it was more than twice the price. We still didn’t want to ride the mainland coast road, so we opted to ferry out of Stari Grad, leaving us a day to hire a scooter and travel to the other end of the island. Hvar is probably the most scenic of the islands, with an excellent town and castle. Well worth the visit, but cycling the length of it would be fun.